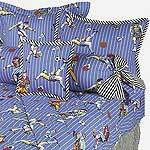 California Kids bedding is designed to grow with your child. Available in twin, full or queen sizes and also comes in green and red. Size: finished 52" x 99"
A great choice for your all-star! Size: Dimensions: 11" x 36"
Put a fun rug in your child's room with the rugs from the Fun Shapes Collection. This 100% nylon machine This rug not only looks great, but is sure to stand up to heavy use. The Fun Shapes Football Sports Rug comes in the shape of a football, perfect for your little fan! Available sizes: 28" x 45"